We have faith because God is faithful, we are generous because God is generous. He went first, led the way and invites us into imitate himself. We tap into a new, better way of living when we simply reflect to nature, character and goodness of the one who saved us by being faithfully generous. 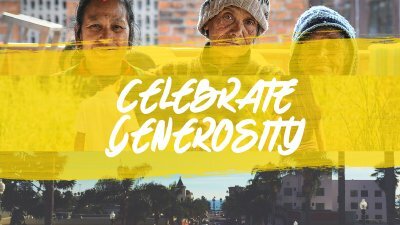 Ephesians 5:1; 2 Corinthians 5:14-15; Hebrews 11:1; Genesis 22:1-19; Romans 8:32; 1 Timothy 6:17-19 Celebrate Generosity on October 16: A day where we celebrate the Lord's goodness and our anniversary as a church. And there are a few things that are unique about that day: (1) we gather all our churches, Camarillo, Thousand Oaks, and Ventura, to celebrate, worship Jesus, and enjoy each other and (2) we invest 100% of our offering that comes in that morning and the following week to our justice, compassion and reproducing church initiatives.